LOVERS of fine art should clasp their hands in prayer and appreciation every time they are reminded of the dark days of the Second World War and the forces of fascism – and they should whisper one small word in recognition of their thanks: Manod . . .
A couple of nights ago I was sitting in my tent behind the Swallow Falls Inn near Betws-y-Coed, north Wales, poring over my ragged 1984 edition of the Ordnance Survey sheet 115, when in the bottom right-hand corner, and in the smallest of typefaces, I spied the word “Manod”. A mossy boulder rolled silently in the chasms of memory – and a pale ghost slid from the darkness. Manod is a place of mystery, a forbidden fiefdom controlled by the forces of the State. People who venture there do not necessarily return. Did I ever tell you about a chap called Eric Holland? Of course I did (see previous post). It’s only in the past few years I’ve come to appreciate what a wealth of knowledge Eric possessed. Eric was familiar with the secrets of Manod and its sinister legacy. 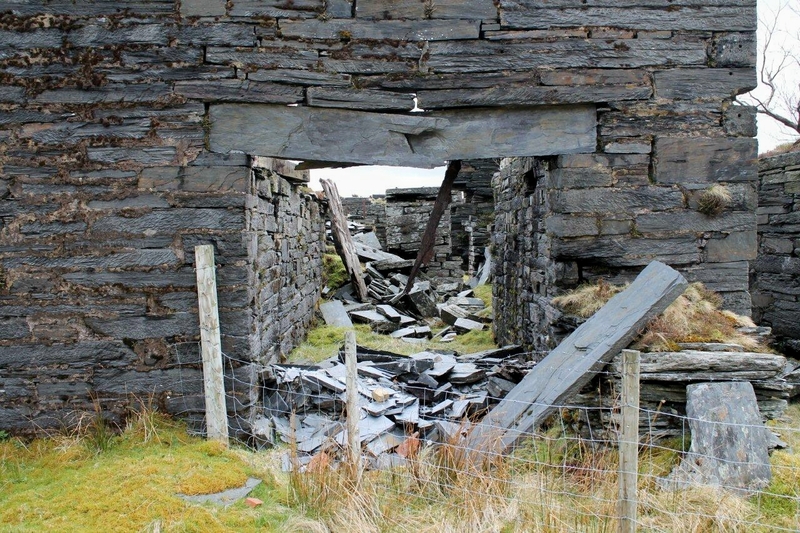 Manod is an abandoned slate mine in the hills above Blaenau Ffestiniog in which the nation’s art treasures were stored during the war, he told a group of us in hushed tones one night over several beers in a Betws-y-Coed pub. 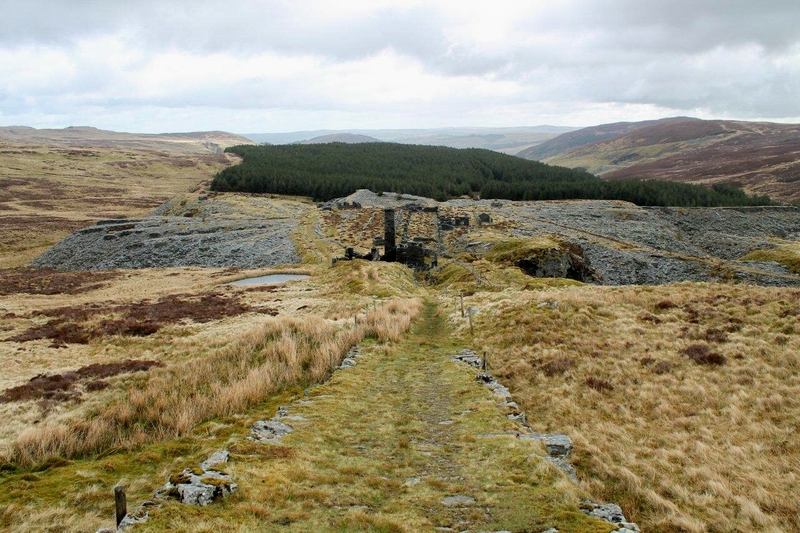 The entire national collection was driven in lorries up a Welsh mountain and placed in special bunkers deep underground, he continued. After the war the paintings were removed – and Manod was converted into a secret nuclear bunker with the onset of the Cold War. “It’s still a nuclear bunker today,” he whispered, nudging an empty glass into the middle of the table to emphasise it needed filling. 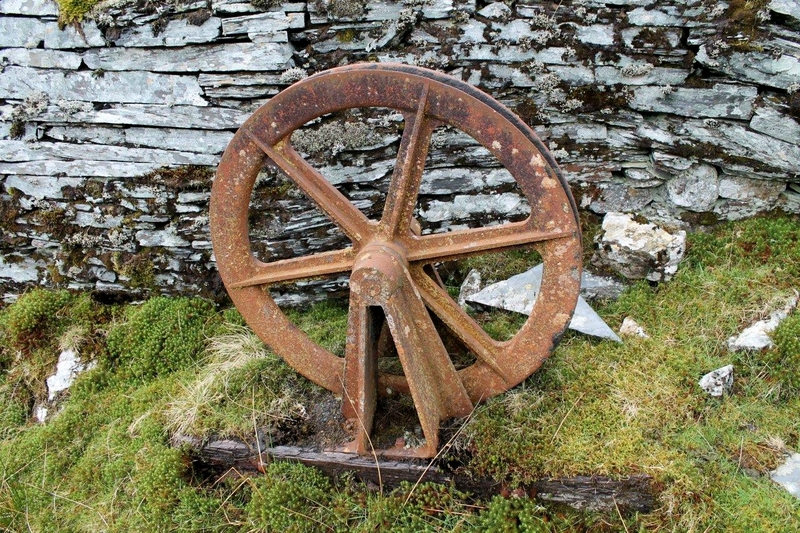 The history of Manod is now well documented on the internet, but Eric had acquired this information in the days of clockwork trains and tin baths. God knows how he came across it. Like I said, he was a fountain of knowledge. We mulled over the worst-case scenario if we were spotted – and the worst case was we’d be shot. 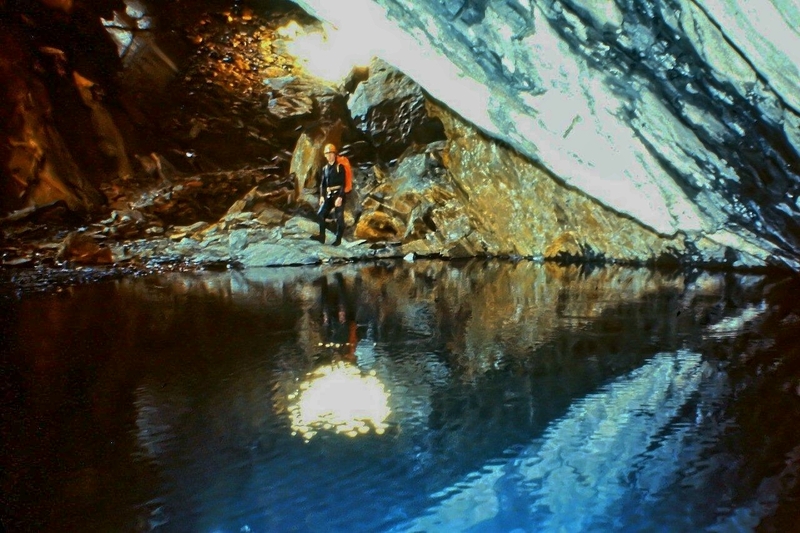 A less-than-worst-case scenario was that we’d become entangled with a Dr Who film crew (all Dr Who episodes in those days were filmed in Welsh slate mines) and be interrogated by The Brigadier. 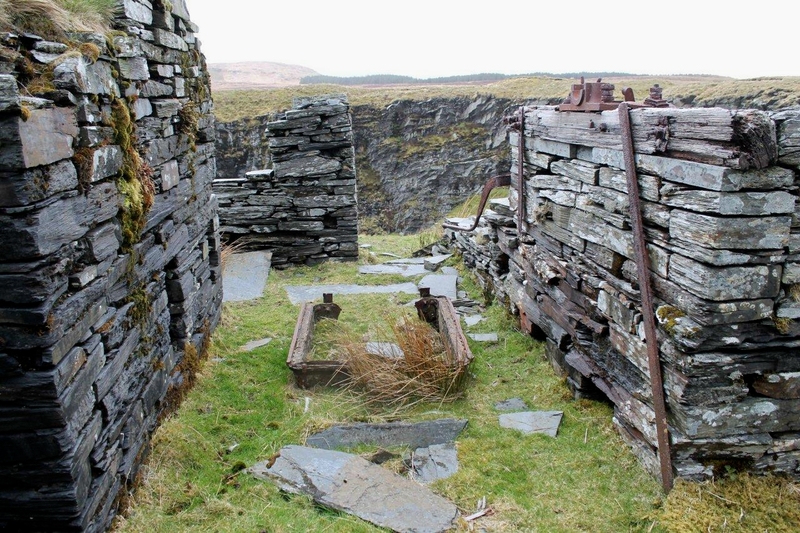 The following morning we bumped up the track in a load of old cars only to discover that Manod was not an abandoned slate mine in the middle of nowhere – it was a thriving quarry employing a number of people, but everything had been locked up for the Easter holiday. I’ve included this picture purely for personal satisfaction. 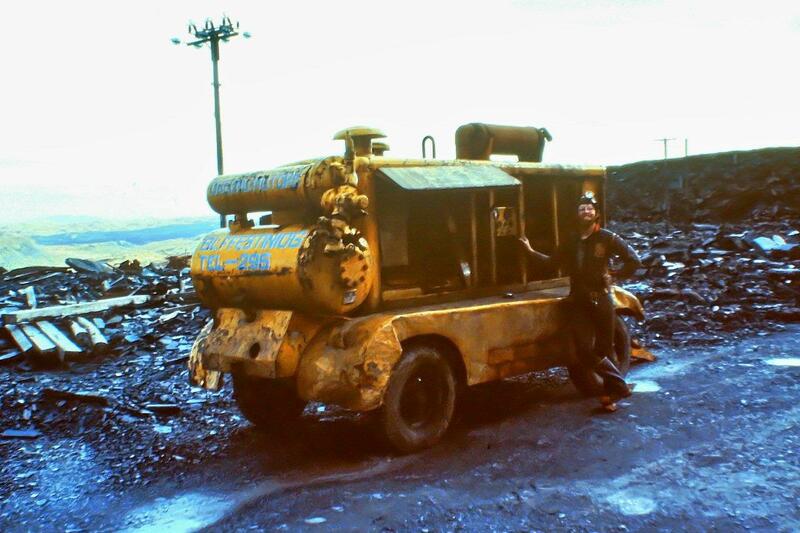 This is me standing next to a CP (Chicago Pneumatic) 600cfm compressor up at Manod in 1982. 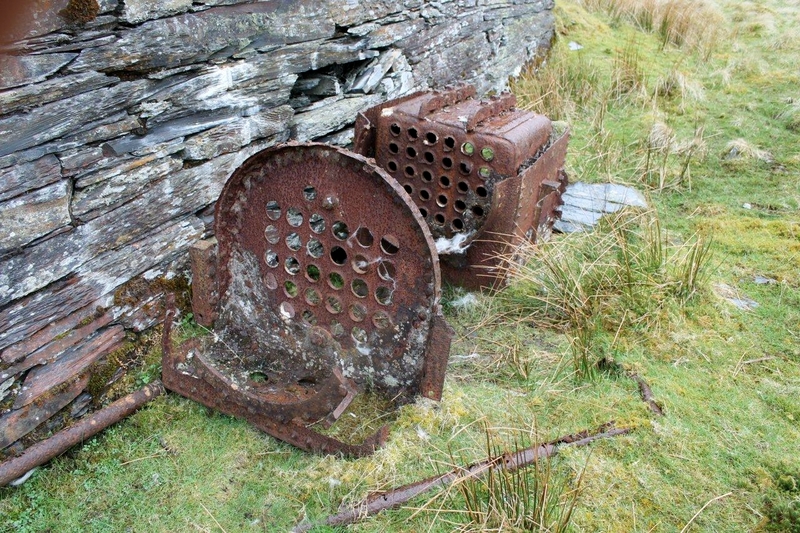 At that time I worked with a similar machine at Stainton Quarry near Barrow. When I saw it standing there it was like meeting an old and dear friend. We bonded. I suppose it’s a man thing. Today I’m pulling my boots on in Cwm Penmachno and feeling slightly irritated because there’s another mossy boulder that refuses to roll. 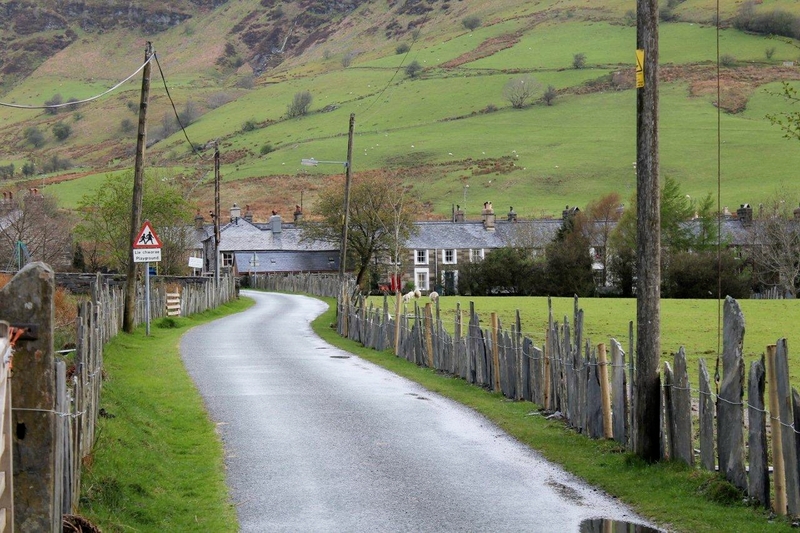 Manod is way above me to the south-west, but there’s a hamlet a couple of hundred yards along the road called Glanaber Terrace – and that name is uncannily familiar but I don’t know why. 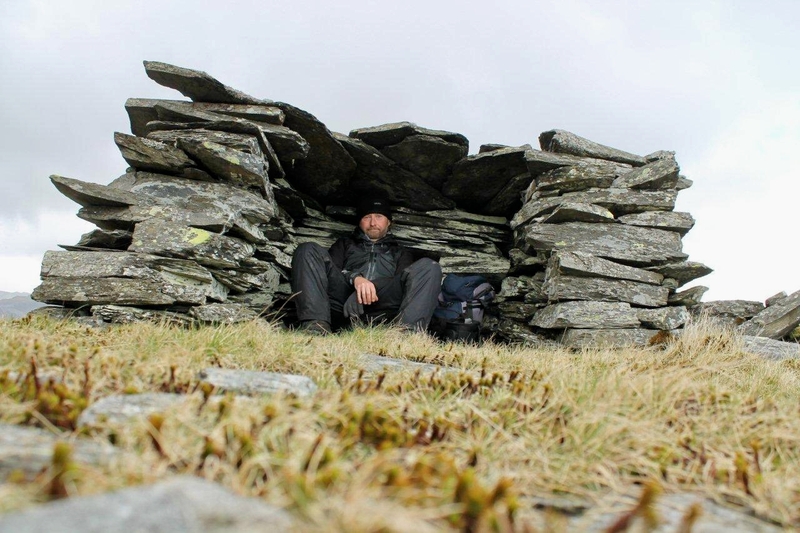 I roll it around my head – Glanaber Terrace. 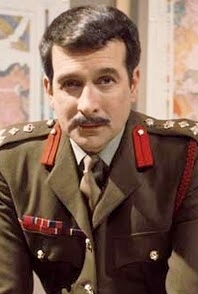 I wish The Brigadier was here to jog my memory with his swagger stick. 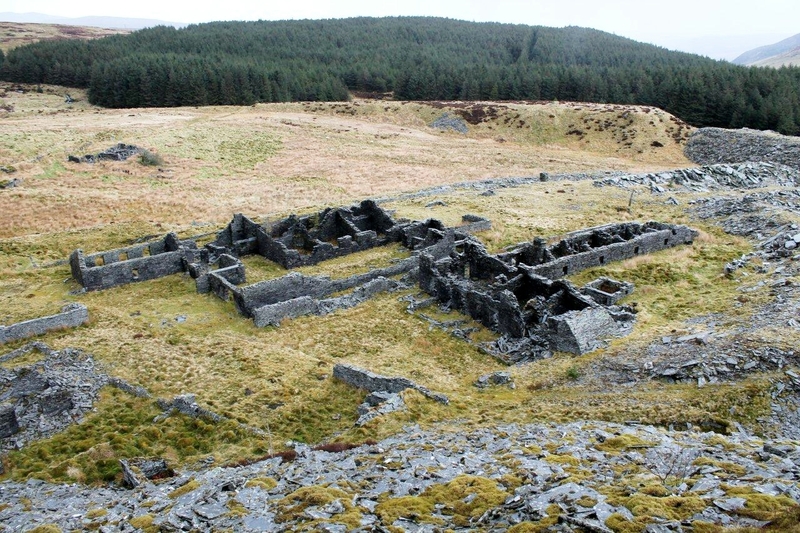 I clamber through the ruins of the Cwm Penmachno slate industry – which are considerable – through a forest and onto an open mountainside that is absolutely covered with slate tips and abandoned buildings. I reach Manod, which is still a thriving quarry, and keep my head down when the hooter sounds for blasting – which it does several times during the next couple of hours. 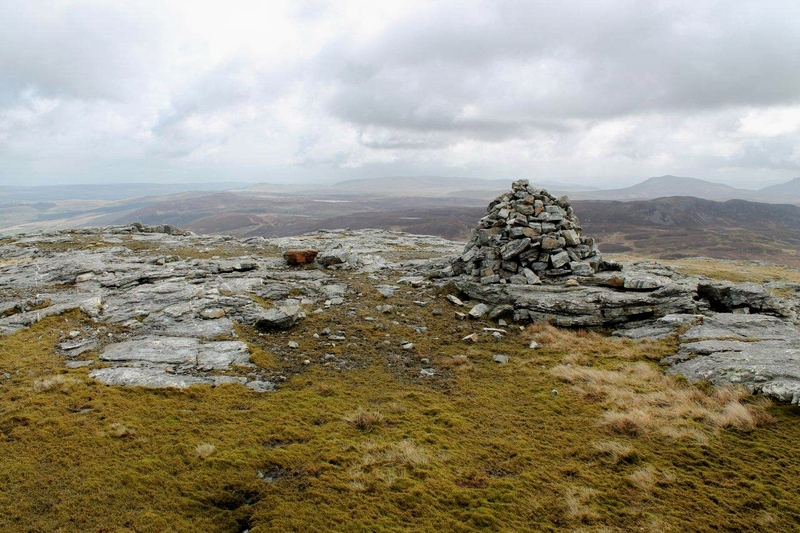 I then climb to the summit of Manod Mawr (658m, 2,158ft), and in an absolutely evil wind that discharges bursts of snow and hail, head north to Cwt-y-Bugail quarry seeking shelter. Incidentally, the soldier lurking on the skyline is still up there. He’s a short length of telegraph pole with an electrical distribution box bolted on. Damned clever ruse that. Certainly had me fooled. Let’s talk environment. 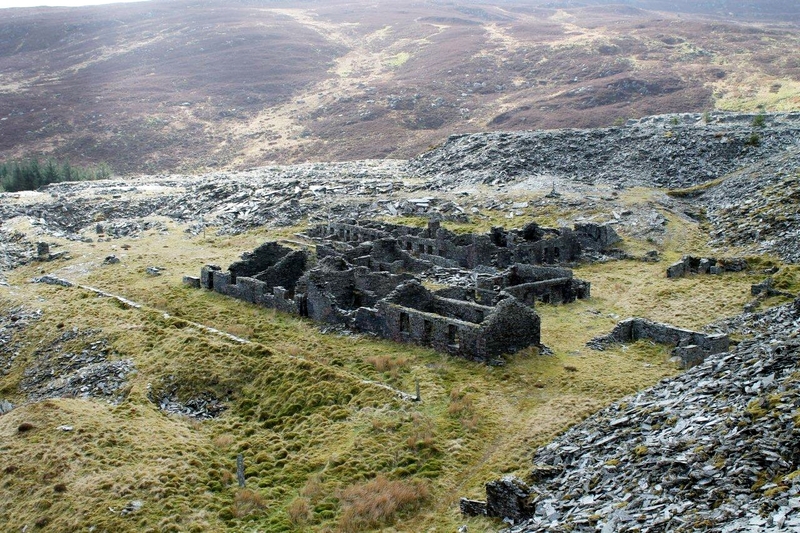 These quarries have ripped open the countryside and left colossal tips and ruined buildings strewn across what was – at one time – a pristine landscape. Are they ugly and repellent? 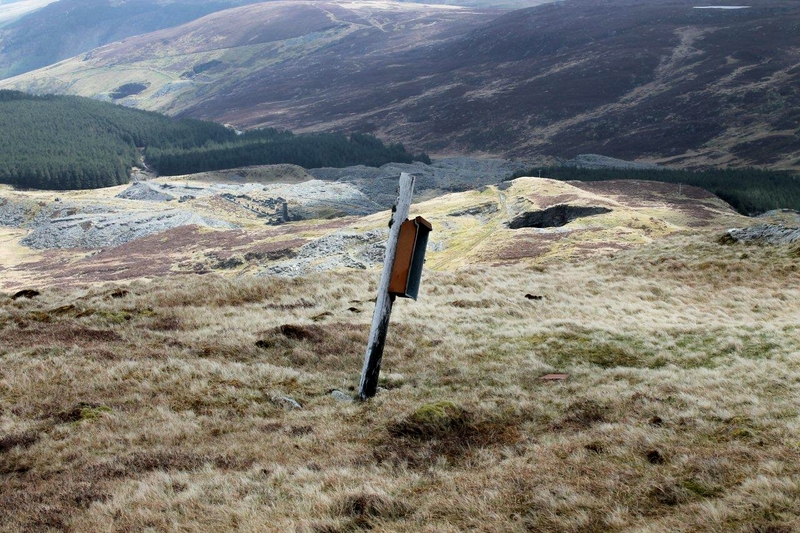 Should all industry of this nature be condemned for its wastefulness and despoliation? Or should we celebrate an impressive legacy left by our forefathers and be thankful they made such an indelible mark on the world, so we can retain a link to our past and therefore learn more about ourselves? 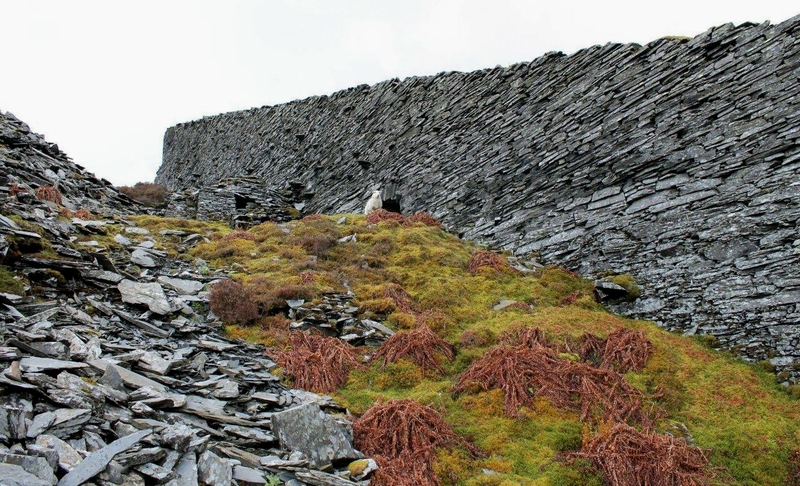 My opinion, which probably won’t surprise you, is that these great gashes in the earth, with their primitive but noble architecture, are among the most intriguing and melancholy places on the planet. Have they had an impact on the environment? Certainly – but no more than the bag of cement you purchase at B&Q, or the builders’ sand, pallet of bricks, stack of breeze blocks, bag of nails, copper central heating pipes, electrical cables and much, much more – because nearly everything that makes your home stand up and function, except for the wooden bits, comes out of a hole in the ground. Nowadays we don’t see the holes because planning regulations stipulate they are screened behind belts of conifers and artificial banks, thereby creating the false impression that the physical environment is less tampered with than it actually is. 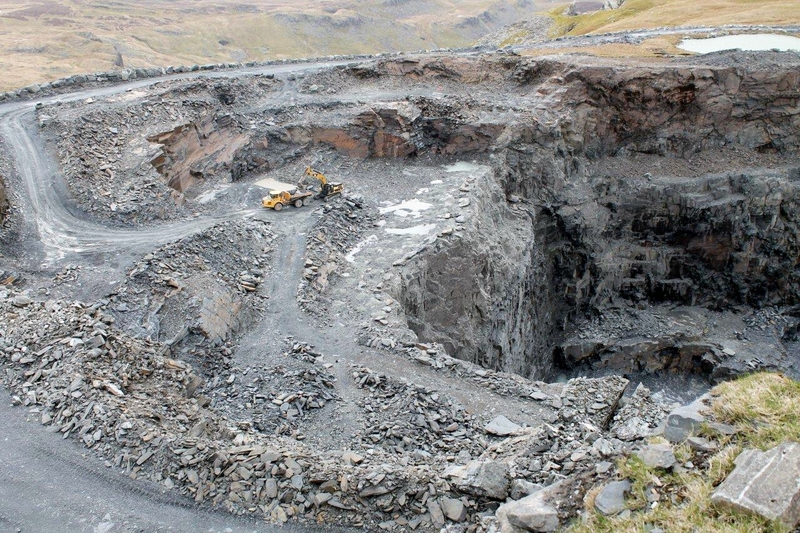 It is possible to drive through County Durham and Northumberland and not see an opencast coal mine, but there are dozens up there – enormous holes full of enormous machines, all hidden behind mounds and alien trees. Why are they hidden from us? Why can’t we peer down into our native geology, marvel at the riches beneath our feet and take stock of what we are doing to the planet? Your mixer taps, the kitchen sink, the tiles on the floor, the plaster on your walls, the glass in your windows, your car, your lawnmower, your garden gnomes – they all come out of a hole in the ground. 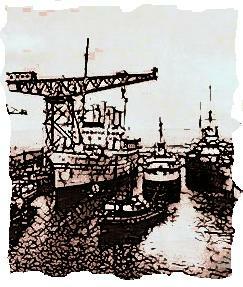 Everything comes out of a hole in the ground, be it a quarry, a mine, a clay pit, a sand pit or a pipe in the North Sea. 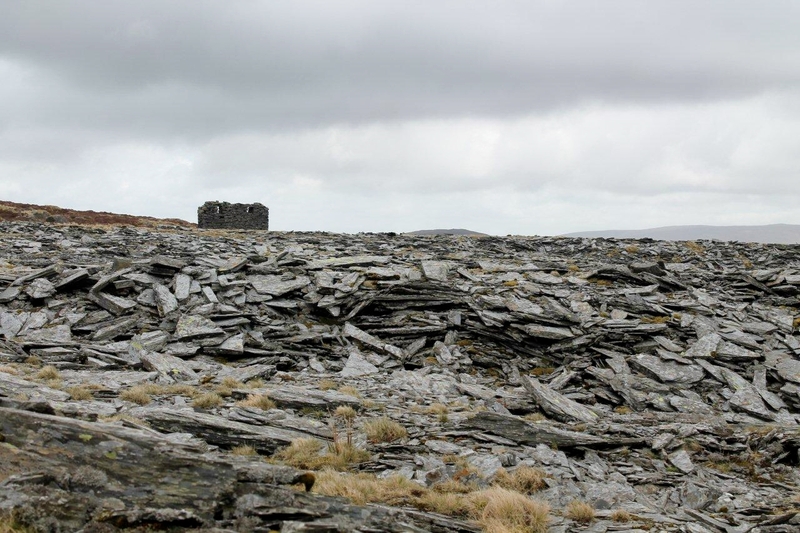 The landscape of Snowdonia has been chopped and gutted. 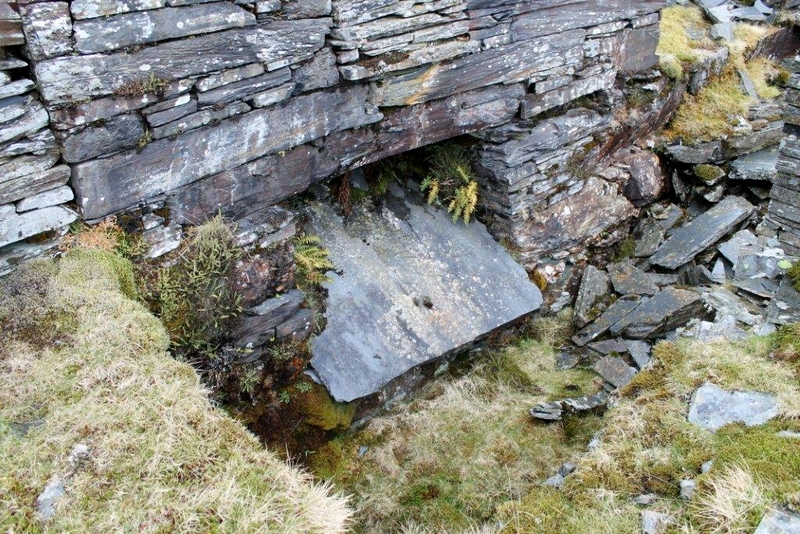 But these slate quarries and the machinery in them were worked mostly by water power and gravity. Their environmental impact was visual rather than harmful; their carbon footprint low in comparison to most heavy industries. Did I just say nearly everything was powered by water and gravity? This is the skeleton of a steam boiler. So I’m sailing down the northern slopes of Manod Mawr with a south-westerly gale filling my waterproofs, heading for another rash of abandoned quarries and thinking: if these legacies of the industrial age were so important, having roofed every British town, city and village that did not have access to red pantiles, why are they now being sacrificed to the forces of nature? If they were the stately homes of the rich they would have been snapped up by the National Trust and we could have had the privilege of paying half a day’s pay on the minimum wage to take our families round. If they were the dilapidated castles of tyrannical Plantagenet kings who bequeathed nothing but a shameful legacy of blood and strife, then the English Heritage flag would be fluttering from the highest tower. 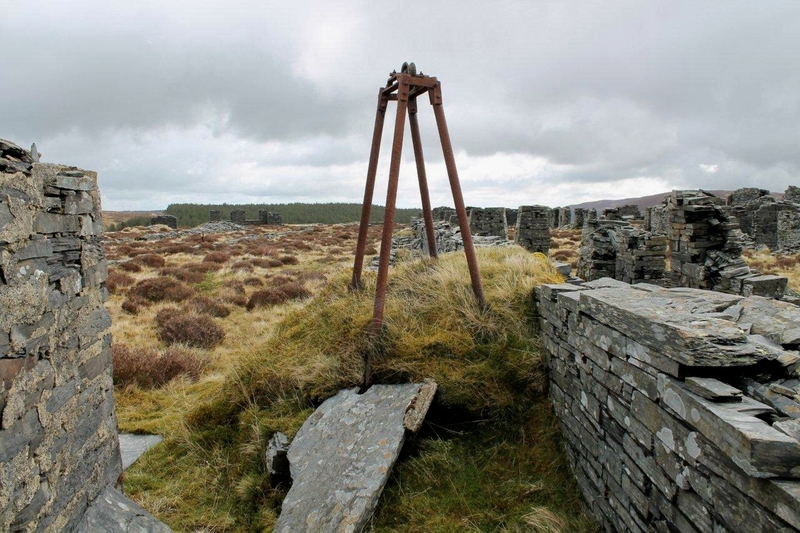 But the walls, the humps, the deep gashes, the strange structures on the skyline, they were built and worked by the toiling classes. And the monuments to their labours and colossal contribution to society have been left to return to the earth. Is that a good thing or a bad thing? I don’t know. It’s still raining and my feet are wet. And I still haven’t worked out why Glanaber Terrace has such a familiar ring. Perhaps I’ve been there in a previous lifetime with The Doctor and The Brigadier. So I shall leave you with some pictures and captions. They tell the rest of today’s story . 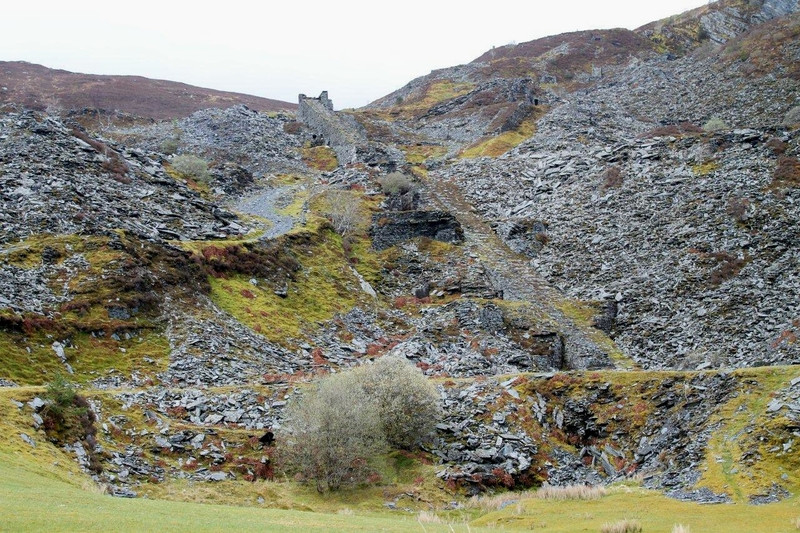 . .
Cwt-y-Bugail is an old, old quarry that finally closed in the early 1960s. It’s a handy place to find shelter in a storm. 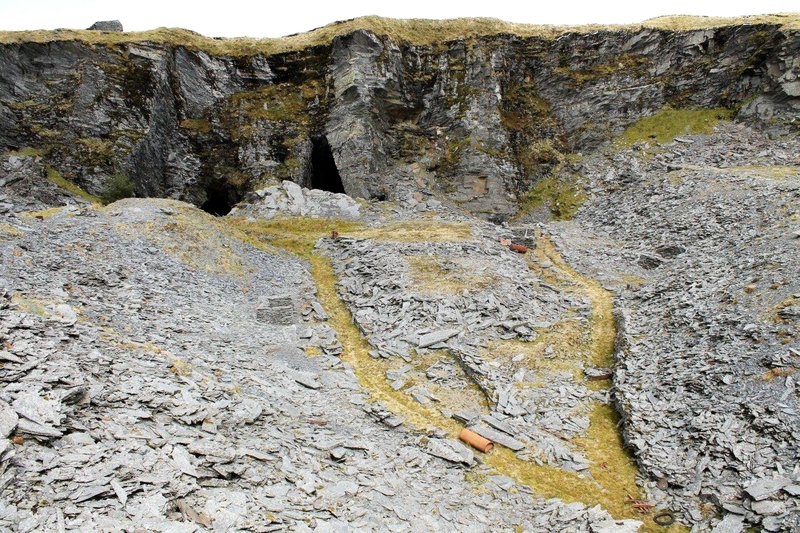 The open quarry leads into impressive caverns. The underground shots among the contemporary pictures below were taken on our ill-fated Manod trip in 1982. 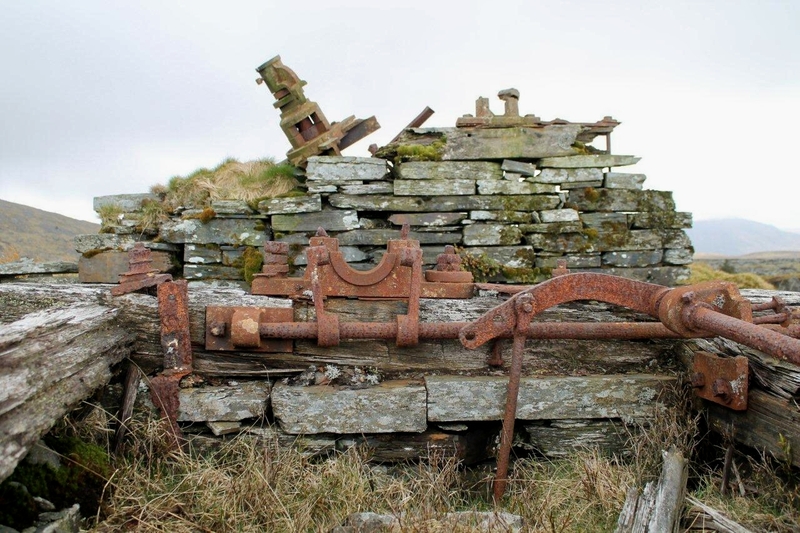 Old and rusting machinery is strewn about the place. 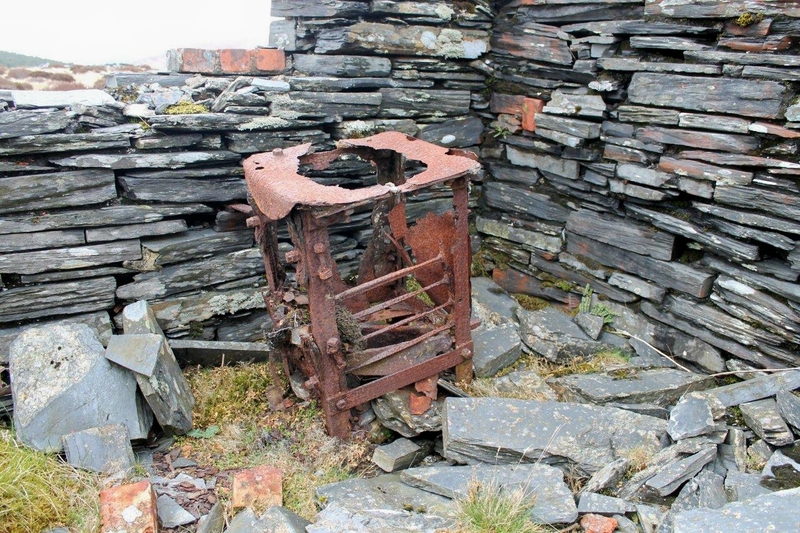 At the top of an incline is an iron muck tub that has almost been reclaimed by the earth (second picture down), as if the planet is renewing itself. What came out of a hole in the ground is again consumed by the ground. I like that thought. 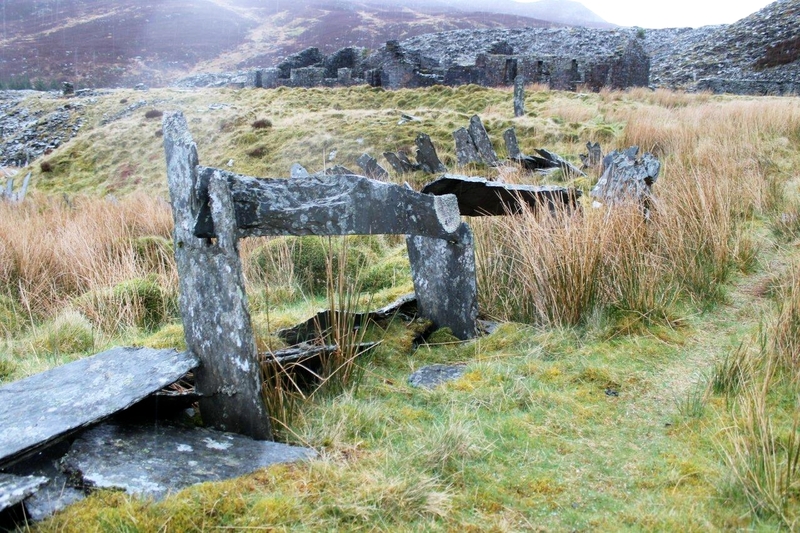 In the ruined sheds, the wooden frames of dressing machines (below) stand abandoned among the stones. Dressing machines are like cylindrical guillotines. You slip the edge of a roofing slate under a revolving blade and it clips it neatly. Poke too much through and it will whip the slate out of your hands if you’re not careful. These machines here were powered by overhead shaft and belts. 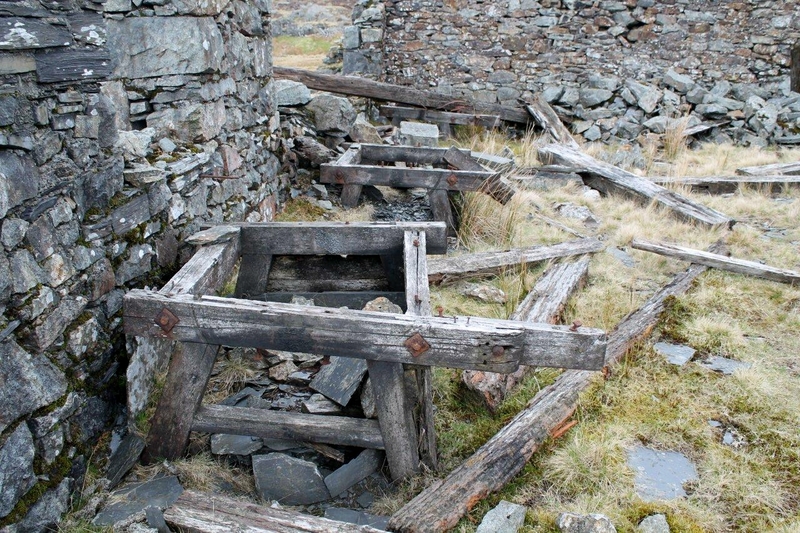 The dressing sheds at nearby Blaen-y-Cwm, below, were powered by waterwheel and the waste chippings slid down chutes into muck tubs, to be trammed away to the tips. This is extremely high-tech for the slate industry. I am impressed with this place. But there again, I’m the sort of bloke who’s easily impressed. 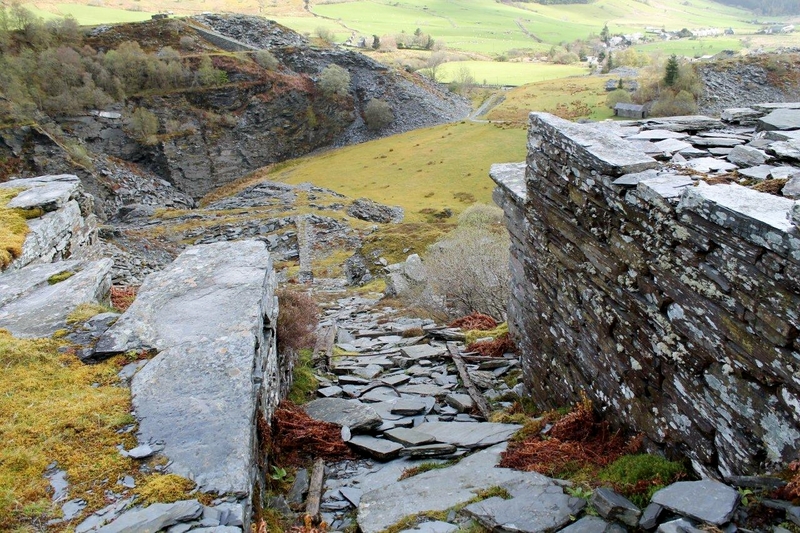 Slate fences and hurdles down at Rhiw-bach. 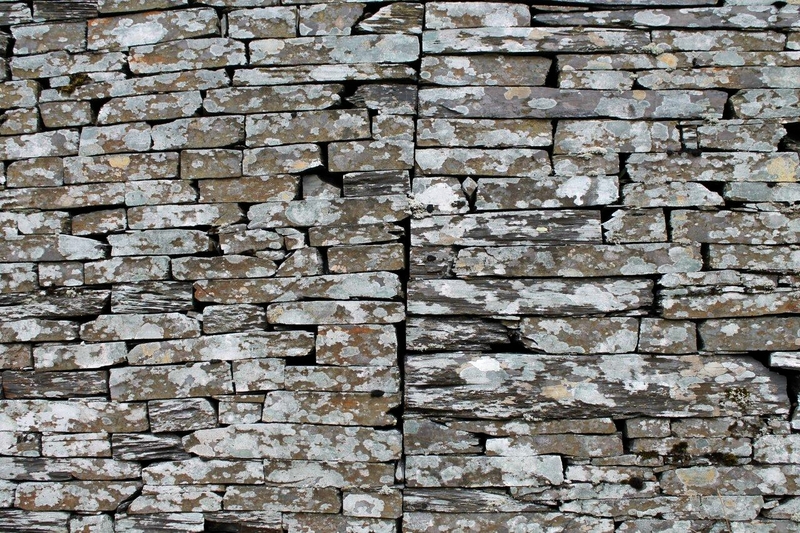 There is nothing that cannot be made from slate. Well, there probably is, but you know what I mean. I search for this place all day but fail to locate it. I eventually find it on Bing Maps from the comfort of my chair, and it is much nearer Glanaber Terrace than I assumed. 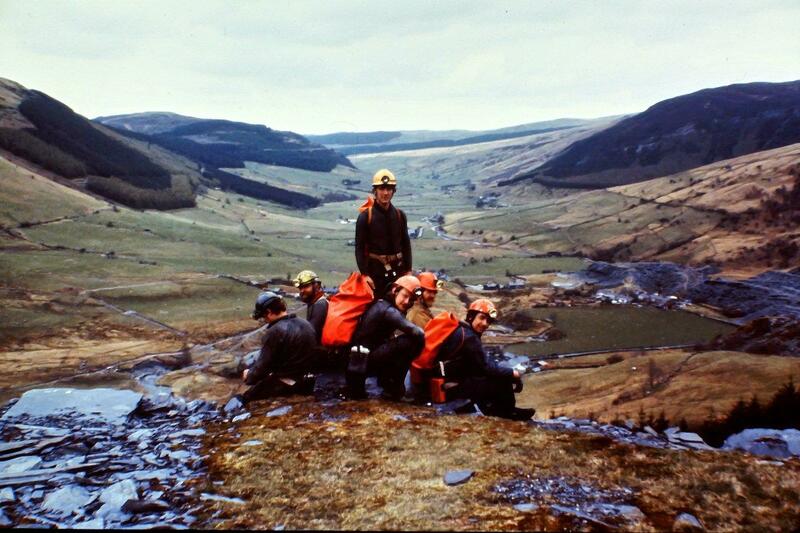 In 1982 we spent a couple of hours poking about underground at Rhiw-bach and popped out of the mountain on this tip here above Cwm Penmachno. From left, Colin Horne, Mike Mitchell, Mark Wickenden (standing), Chris D Jones, Peter Fleming and David Blundell. That’s enough memories. Too many aren’t good for you. I think it’s about time I climbed some serious mountains . . . 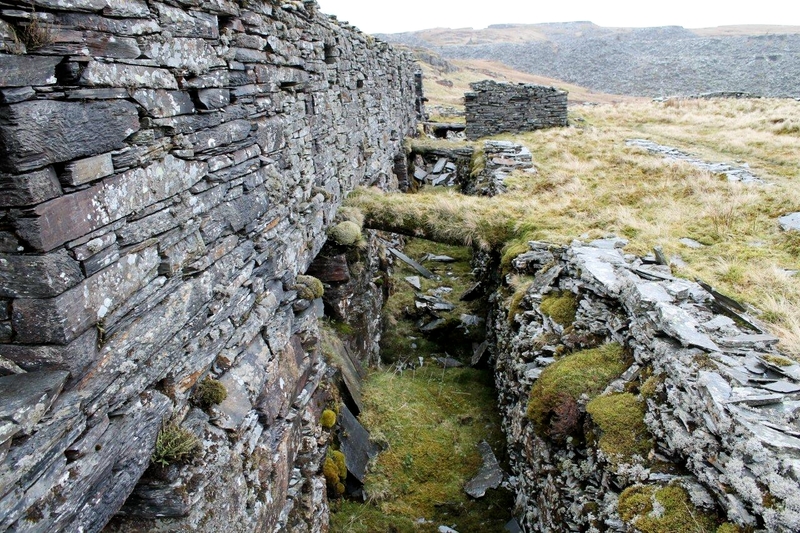 The National Gallery has a web page devoted to the wartime storage of paintings at Manod. It can be accessed here. More interesting websites here and here. 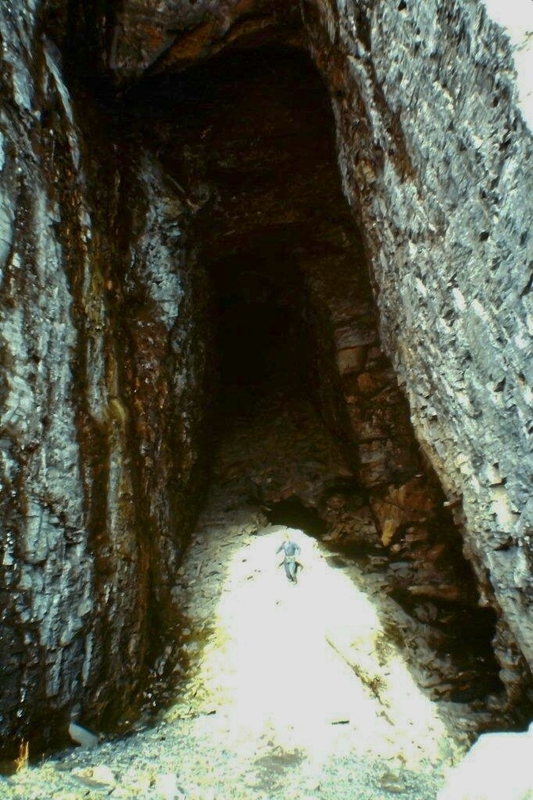 This entry was posted in Archaeology, Camping, Caving, Environment, Geology, Hiking, History, Industrial archaeology, Mountains, Potholing, Quarrying, Ranting, Second World War, Slate quarries, Walking and tagged Mining History, outdoors, Snowdonia, Wales, WPLongform. Bookmark the permalink. 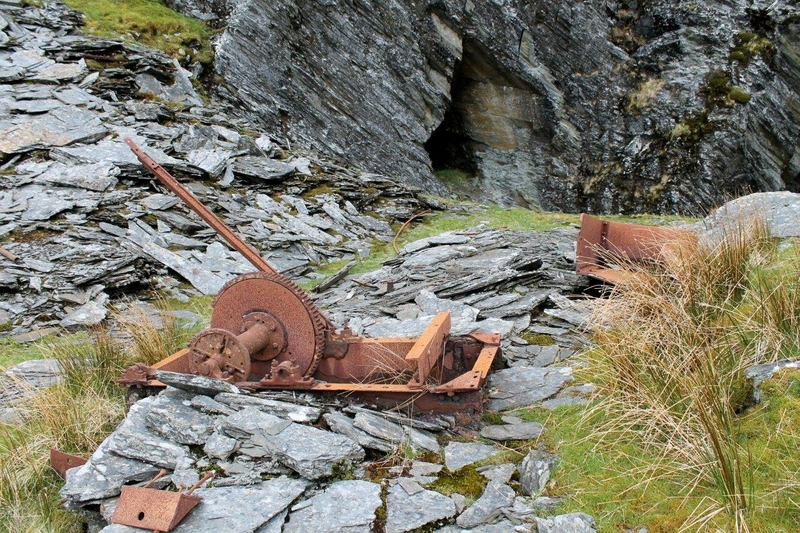 That was a Incredibly interesting read with some very nostalgic photos of the old slate mines & abandoned machinery. 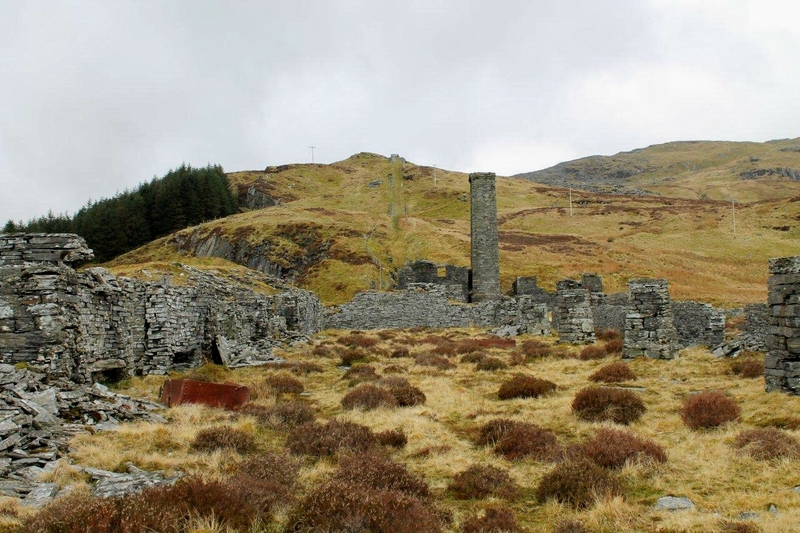 The old mines are part of our local heritage & should be regarded with respect in many ways, they are the museums of our landscape & should be treated so. Hi Paul. Yes, you’re right. I like that line about them being the museums of our landscape – very evocative that. Wish I’d thought of it. Thanks for the comment, and I hope you’ve bought some suntan lotion. Hi Jo. Eric was a danger to everyone, never mind himself. Alas, he is a danger no more and the world is a less interesting and poorer place. Penmachno is a wonderful place and I intend to return sometime. I’m glad you liked the photographs. I don’t know when it was you were living there, but I visited the valley again in 1986 with my wife and son. It was an absolutely horrendous day, and I left them playing Thomas the Tank Engine tapes in our old Land Rover while I got soaked in the mountains. 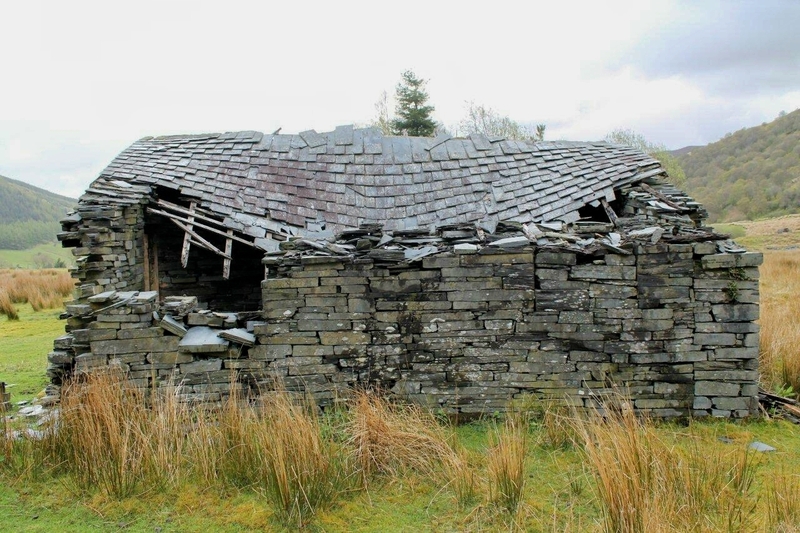 That night Wales was bombarded by the tail end of Hurricane Charley, and nearly all the tents on the site in Betws-y-Coed were blown down – except ours, which I’d lashed to the Land Rover. All that Anne can remember is rain and Ringo Starr reciting Thomas the Tank Engine. Happy days. PS: Just done a search on Hurricane Charley. 100mm of rain fell in 24 hours in parts of Wales. That is a LOT of rain! You deserve a medal (and so do your wife and son!) We lived there between 1988 and 2009 – a wonderful place for the girls to grow up. Frequent horizontal rain, and the river used to burst its banks, but on the fine days in summer it was breathtaking. I don’t remember Hurricane Charley at all – think we would have been in Shropshire at that time. Sorry to hear that Eric is no more. He sounds like a film should be made of his life! I like the sound of the fine days in summer. They make everything else worthwhile. This is an interesting story, Alen. Some locals must have known about the hidden treasure. It is a bit funny that the government was unwilling to let go of the chambers of Manod but on the other hand it is always convenient with secure sites. Sad about Eric Holland you describe him as a unique person. Hej Hanna. Good to hear from you. 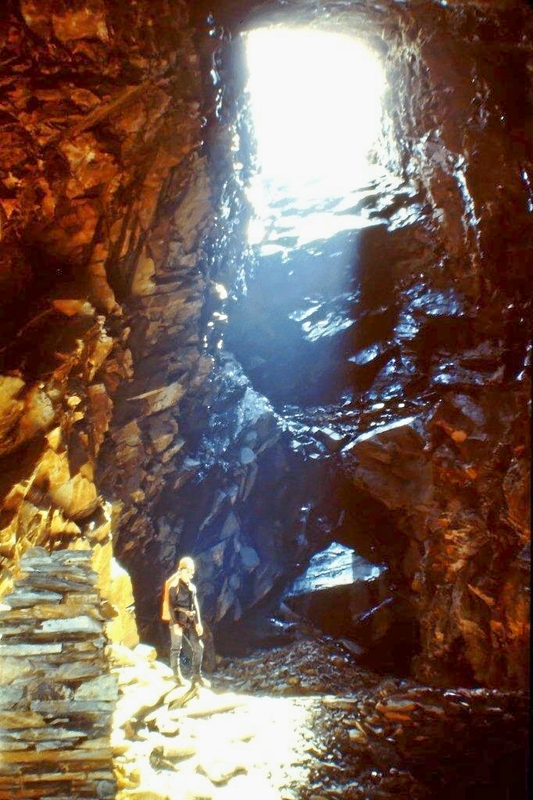 Yes, the local people must have known about the treasures because some of them will have worked on the project – and there would have been plenty of rumours flying about. Stuff like that intrigues me. It’s always handy to know about these places, just in case someone starts a nuclear war. Stock up on beans. Eric was unique, a complete one-off. He was outrageous, colourful and always had a story to tell. I should do a post on him sometime with lots of pictures. Hi Dabawenyo life. Thanks for that. Adventures are always good to look back on – especially if you can have a laugh at them. Have a lot of catching up to do ! Hi Alex. Have you been hibernating again? I’ve been keeping an eye on your blog waiting for your latest walk. 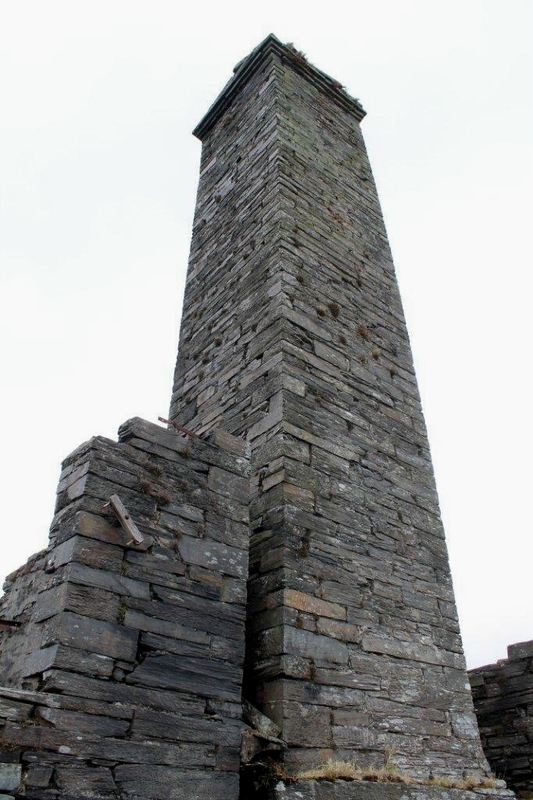 I’ve never been in the quarries around Llanberis, except for the museum there. Sounds like I should put it on my lest.